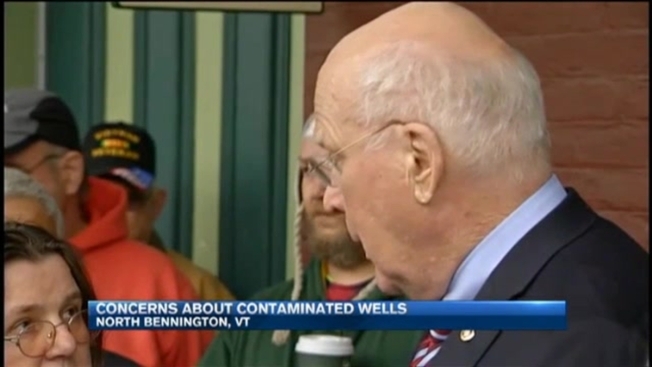 As testing in Southwestern Vermont continues to determine the extent of chemical contamination on private wells used for drinking water, the towns of Bennington and North Bennington got visits Friday from Sen. Patrick Leahy, D-Vermont. The Rev. Penny Smith of Bennington attended a meeting with Leahy in North Bennington, and said she appreciated the close attention he as well as the administration of Gov. Peter Shumlin, D-Vermont, has paid to the communities' water contamination emergency. "It certainly has made things more difficult," Smith said, describing the fact she now must use bottled water to drink, cook with, and brush her teeth with. "The worry about health is probably the most important thing. Everybody is starting to question what [the water contamination] means about their health down the road." Nearly 100 private wells so far have been found contaminated with the chemical PFOA, which is linked to thyroid disease, certain types of cancers, and other ailments. The Vermont Health Department has said it could find no spikes in kidney or testicular cancers in the affected area. The suspected source of the chemical contamination is a former manufacturing plant in North Bennington known as ChemFab, which used the substance to treat industrial fabrics. While private wells are affected, municipal water lines are safe, the Shumlin administration has said. Friday, Leahy heard a wide range of concerns from residents, who expressed worry about the possibility of health effects, whether they may see declining property values, and how long it will take to find solutions. Leahy told residents he will press for more federal funding for chemical research and environmental protection for water sources across the country. "Ask a parent if they want money spent to make sure their children are getting clean water, or do they want money spent on an offshore war," Leahy said, explaining that the safety of the environment and drinking water should a national priority. "I don't need to take a poll to know what the answer is on that." Another big question property owners near the plant have is what the impact of PFOA, if any, will be on the soil. Is the contaminant lingering in the earth, they wonder? And if so, should they hesitate to plant vegetable gardens this summer? Test results on soil samples are expected in the coming weeks, the Shumlin administration said. "We have a pretty good understanding about lead and what it actually does to you," Dr. Harry Chen, Vermont's health commissioner, said, drawing a distinction between the Bennington County situation and the lead poisoning crisis in the water in Flint, Michigan. "We don't have that same kind of understanding about PFOA, because it's an emerging toxin." Chen noted that much more study is still needed to understand how extensive exposure to PFOA would have to be before health problems emerge, how much the presence of PFOA in water would be transferred to plants grown with it, and how much of the substance would stay in a vegetable consumed by humans. The state and towns are looking into extending public water pipes to homes with private wells, and are investigating the capacity of the current municipal water sources, the Shumlin administration has said. In the meantime, the plant's owners are paying for filtration systems to be installed in homes of affected well owners, to give peace of mind to people like Penny Smith. "I'm trying to remain optimistic," Smith said. For more information on PFOA contamination, and what resources are available to affected residents, visit this website.